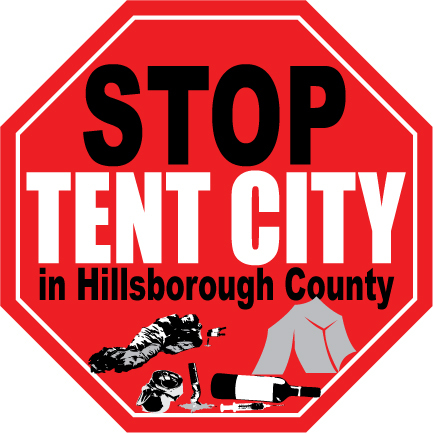 Speaking of the homeless, some Hillsborough County residents crying NIMBY packed a county land use hearing earlier this week, trying to convince officials to deny a permit for a tent city much like Pinellas Hope. Catholic Charities, the same group that set up Pinellas’ tent city, wants to put up a similar camp on 6410 E. Hillsborough Avenue near Harney Road, on a piece of property they own. When neighbors found out about the proposal, they organized fiercely against it with images like the one to the right (OMG! Syringes!). One East Lake Park woman even created a little group: Stop Tent City. They even have T-shirts. Yes, T-shirts! The residents do have some good points — Pinellas Hope isn’t located near a neighborhood and Catholic Charities is counting on tax dollars instead of their own wealth to bankroll the project — but the rest of the site is filled with a lot of misinformation on how much the homeless want to be homeless and how a large percentage are snowbirds. They also complain that the homeless would be so far from social services. But where were these people when the city of Tampa began harrassing the homeless downtown? Hillsborough County’s street people have been pushed from one side of the county to the other when some neighborhood complains about them. Now, in this recession, the number is growing rapidly and there just is not enough shelter space for them. Of course, residents are just falling over themselves about the poor conditions inside the Pinellas tent cities and suggesting alternative plans for more dignified housing (as if a tent is worse than sleeping behind a dumpster). But what happens when the permit is denied? Does anyone honestly think any of these residents will be helping Catholic Charities implement another plan? Maybe these Stop Tent City folks could get together with Bill Maxwell. He might like one of those shirts. The Bipartisan Guide to Ridiculous Legislation is back!